I cannot afford the beautiful chocolates here. I cannot afford the amazing pieces of art that they call cake. I cannot really justify the expense of any of this crazy indulgence, but I go in anyway. This is one of my favorite spots for a date. What a creative way to spend $15 instead of going for drinks. Little do you know when passing by that behind the room of retail treats is a tiny little cafe. It is there that you will find tiny cups of the most unbelievable hot chocolate you’ve ever tasted. 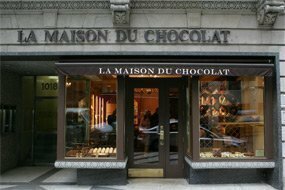 Yes, the price is completely insane, but when they tell you it’s because they fly the chocolate in from Paris every morning, you will believe them. When the chocolate reaches your brain, you will suddenly find yourself thinking that an $8 shot of liquid gold is absolutely and totally worth every penny.